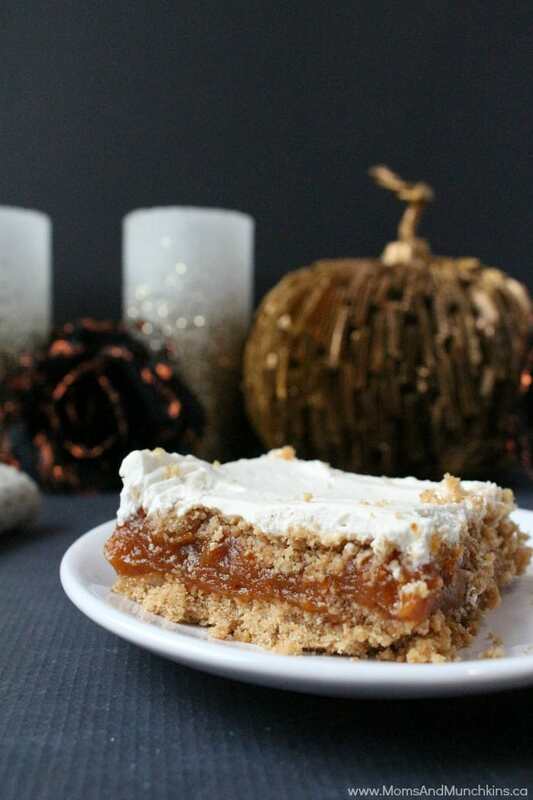 This pumpkin dessert is delicious! Even people who don’t like pumpkin pie have said that they love this. This dessert is quick & easy to make and requires only a five ingredients. 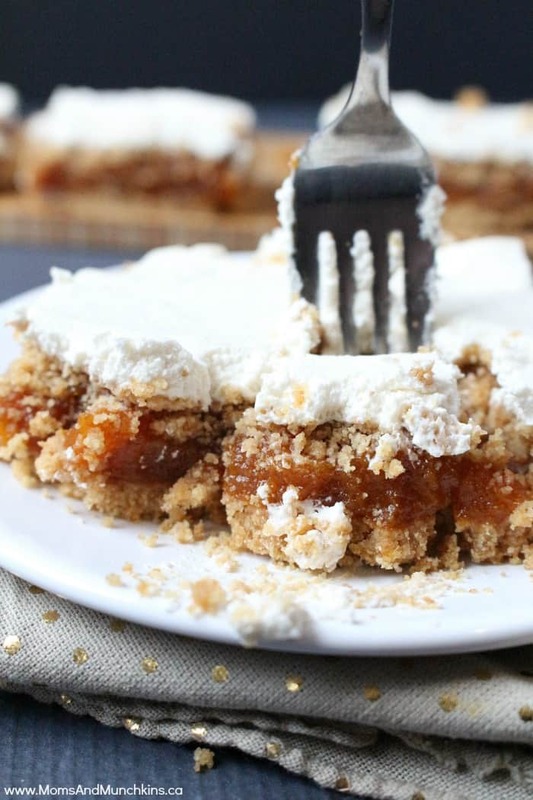 It would be a great alternative (or addition) to your traditional Thanksgiving dessert table. The pumpkin filling is mixed with marshmallows – a combination that sounds a little weird but trust me when I say it is so good! This is absolutely delicious and super easy to make. In a large pot over medium-high heat, melt marshmallows with pumpkin. Stir constantly because it can burn easily. Melt the butter in the microwave in a medium bowl. Add graham cracker crumbs to butter and stir to mix. Press ¾ of the graham cracker & butter mix into the bottom of a 9 x 9 pan. Top with pumpkin & marshmallow mixture. Top with remaining graham cracker mixture. Beat heavy cream and vanilla on high until soft peaks form. Once the pumpkin mixture is cool, top with whipped cream. 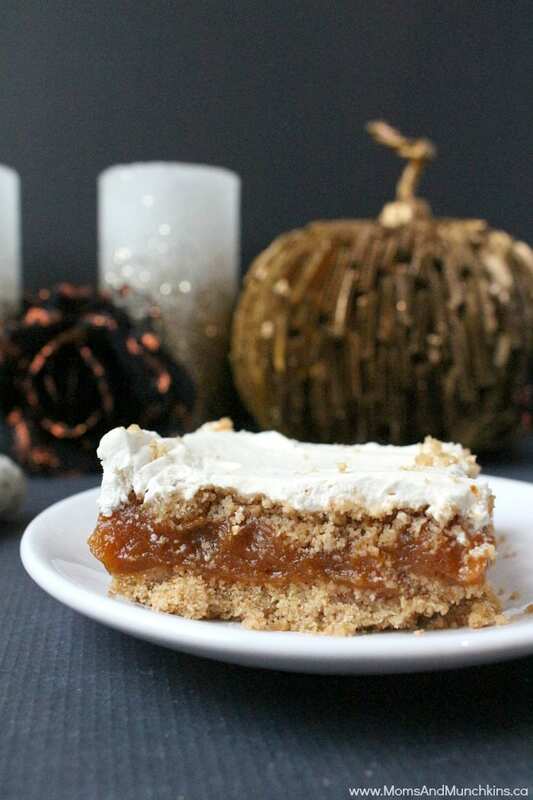 This pumpkin dessert will get gobbled up fast! It always does in our house. Did you know that Moms & Munchkins has loads of free printable games? We even have some perfect for Thanksgiving! Visit our Thanksgiving page for more fun ideas. We have a free printable Thanksgiving Word Search, Thanksgiving Word Scramble, Thanksgiving Scavenger Hunt and ideas for a fun Thanksgiving table for kids. Want to stay updated on the latest fun ideas & delicious recipes? Join our communities on Facebook, Pinterest, Twitter and Instagram. Wow – that looks so easy and yummy!!! What a nice spin on the traditional pumpkin pie! I think that sounds so very delicious. One can never have enough Pumpkin! Your picture is amazing (as usual). That is one delicious recipe! I looks easy and yummy! My kind of recipe! I am absolutely drooling over this…looks SO good! This would be great to link up to Create It Thursday #19…hope you’ll join us! Hi, this dessert sounds so good. I love pumpkin and I would love to try this recipe out. Thanks for sharing on Katherines corner. This sounds both easy AND delicious!!! What a simple but yummy looking fall recipe!!!! Pumpkin recipes and fall. Perfection. Thanks for sharing on Becolorful. This looks delish. This is such a super cute post. I would love it if you would share it at our WIW Linky Party. I hope you can join us.